“Like Don Byron, trombonist Wycliffe Gordon is shedding light on the lost art of live silent film accompaniment. On September 20, Gordon conducted the Lincoln Center Jazz Orchestra in a public tech rehearsal of his new original score to “Body and Soul”–Oscar Micheaux’s classic 1925 silent film. (The piece officially premiered at Avery Fisher Hall on September 24.) Gordon’s project was commissioned by Jazz at Lincoln Center and presented as part of the 38th annual New York Film Festival. 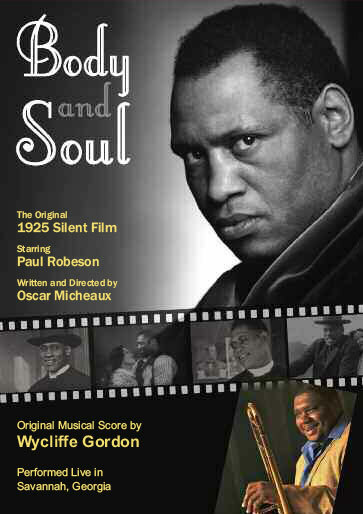 Not only did the event showcase Gordon’s compositional and arranging skills, it also offered a valuable retrospective on Micheaux, one of the most prolific and innovative African-American filmmakers of the early 20th century,” (from AllAboutJazz.com).